Technically, white is not considered a color, but we couldn't care less. We love white so we really like this beautiful white Christmas Tree made with felt. Another plus: it is perfectly sized to fit into interiors where space comes at a premium; for example, this is the perfect Christmas Tree for a New York City apartment, office, dorm, etc. This felt wrapped white Christmas Tree will be one of your favorite holiday decor items for many years to come. One of the most elegant Christmas Trees we have ever seen, it will add a touch of style and atmosphere to your holiday decor. This bendable felt-wrapped Christmas Tree with its elegant felt-wrapped wire branches features an Acacia wooden base. This beautiful white Christmas Tree is perfect for smaller spaces or for the table-top. It stands about 36.5" tall. 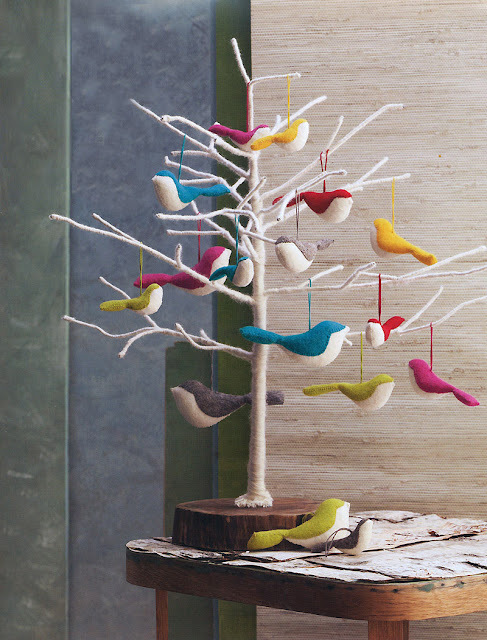 This beautiful felt Christmas Tree is perfect for displaying our felt Christmas Ornaments or your other holiday treasures.